Subscribe to comments with RSS or TrackBack to '2018 Non-Tender Decisions'. I agree that keeping Taylor as a 4th OF makes sense in theory, but he showed late last season just how bad he is at the plate without regular ABs. It would probably be better for him if he were an everyday CF for a bad team. Maybe a tender-then-trade is the way to go. I think Wally has convinced me that they should tender Solis, if only because the 1/6th payout at the end of the spring would be so small if they have to buy him out. If he bounces back, great, but I doubt they count on it and will sign another lefty. I’ve flip-flopped on Taylor, who everyone knows isn’t one of my favorite players. With the Eaton and Robles injury histories, they’re going to need a starting-capable, CF-capable reserve. But as Karl notes, Taylor wasn’t good when he wasn’t starting, and he’s always been a terrible pinch hitter. Maybe they non-tender him and look at someone like Jon Jay in about the same salary range? Then there’s Roark. I noted the other day that some commentors on NatsTalk are wanting to offer him a two-year deal worth less annually than he made in 2018 ($6.475M). I saw that again today. It would be nuts for Roark to take 2/$10M or 12M. Even if he gets non-tendered, he’ll get better offers. The Nats would have to start at 2/$15-16M. And in that range, it gets interesting. There are a number of FA options who would talk to you in that range (or slightly less), including Cahill, Anderson, Miley, D. Holland, Hellickson, Buchholz, and possibly even Harvey and Lynn. Roark has REALLY struggled for the last two seasons, with the exception of later July and August (but then back to struggling in Sept.). There are better starters available in this market for $9.8M than Roark. Wally says they could keep him and then buy him out at the end of the spring, but A) that’s still nearly $2M, and B) they really need a solid contingency option before then (aside from hoping Henderson Alvarez has a fabulous spring). If this was a bad FA pitching market, I’d be thinking that they sorta have to keep him. It’s a good market, though, so they don’t really. They had better be darn sure they believe in what they saw in July and August. They can’t afford another starter meltdown like what Tanner and Gio gave them for much of 2018. So . . . I don’t know. I would be surprised if the Nats just turn Roark out on the street, but that might be the savviest roster-construction move they could make. My guess would be that they’ll try to cut a deal with him. We’ll see. A trade (for very limited return) isn’t out of the realm of possibility. Well, in both cases, that’s what I’d do but I think there is a decent chance the Nats let both go. But let’s think about that two year extension for a second: I think Roark has been a little better than his numbers implied (slightly over 4 FIP the last two years) which is slightly below average. So $7m per year for a league average pitcher is a pretty good deal, even if you just assume a slight bounce back. And would he take it? He’s 32, and has made $12m so far. A 2/$14m deal sets him up for life, and would be something that he’d have to think real hard about passing up. MAT is a different story. I think they will keep him, but i’ve Switched and if they could get Jay or Maybin for $3m, i’d Do that instead. Since the Giants have actually indicated a willingness to part with Bumgarner, I’ll resurrect my fantasy of a trade that includes Taylor and perhaps Solis as well. SF will want at least a couple of prospects, but they’re also going to need guys who can play right away. It will remain to be seen whether the Giants are realistic about their expectations for a guy with only one year left on his contract who is coming off two injury-riddled seasons. I think a package of Taylor, Solis, Crowe, and Daniel Johnson would be reasonable. Tendering Solis just to only drop him later for 1/6th of guaranteed pay: absolutely an option, and his low projected salary makes it even easier. If he was on the hook for millions, different story. I’d buy this logic. Roark: KW as he “really struggled?” over the course of the two hole seasons his 2017 and 2018 numbers seem really similar: https://www.baseball-reference.com/players/r/roarkta01.shtml . His ERA+ is 97-98 range. That’s MLB average. That’s not “really struggling.” So no he’s not an Ace but he’s certainly not a replacement player. I mean, he had a 3.0 bWAR last year. That’s why for me he still has value. 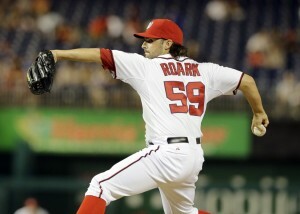 Roark went 1-10 last season during the stretch when the Nats fell apart. He and Gio just destroyed the rotation and the bullpen. In mid-July, his record stood at 3-12 with a 4.87 ERA. He managed to get his ERA down to 3.95 at one point, but then he gave up 17 runs in his last four starts. I’ve been a fan of what Roark has done for the Nats over the years after coming literally out of nowhere, but I’m not giving him ten million dollars based on that body of work. I’m not fond of giving him 2/$14-16, but that’s more in line with what he’s worth, particularly in comparison with all the other pretty decent starters on the market. My hope, however, would be that the Nats add that $9.8M to the pot and go fishing for a couple of significantly better starters in the $15M+ range. Would you agree to non-tendering Roark if it means they have a shot at getting both Morton and Happ? That’s really the ONLY way they would have the money to go after multiple higher-level starters. For the record, I would be somewhat surprised if they non-tender Roark, even if it might be prudent. Understood Roark was bad for a stretch. But he was also then correspondingly good for a stretch to get back. I guess my point is: looking at the end of the year, he looked fine. In 2015 Scherzer was god-awful down the stretch in August, ERA north of 6.00, still finished the year with a 2.79 ERA. Don’t you have to look at the whole body of work? Unless you kind of exactly know why he was 1-10 for a stretch versus why he had a 2.78 ERA for the month of August when it counted and they were trying to get back in the race. If you’re arguing that Roark was worth the $6.475M the Nats paid him in 2018, that’s probably true. The problem is that they can’t pay him that same amount in 2019, and I’m uncomfortable with the delta, particularly with so many other decent starters on the street. Do Lilliquist, Martinez, and Rizzo have a good handle on whether Roark truly “figured it out” in July and August? That pitcher was worth more than $9.8M. But the one in May and June wasn’t, and that guy showed up again in September. It’s a big bet if they make it, in large part because $10M one way or the other would have a lot to do with their offseason flexibility to do other things. I have them with around $35M that they’re actually willing to spend if they tender everyone. For 2019, I like Morton and Happ’s odds for better production than Roark. $6m better($15m v $9)? I dunno but maybe. For 2020, not so sure. Roark is several years younger, and doesn’t rely on velocity to be effective, so I’d bet they slip below his production level In the next year or two. I also want some change, so if you are asking would I DFA Roark if I knew I could get Morton and Happ at a net + $20m increase, the answer is yes. When you get to Miley, Cahill, Anderson, etc, I swing back to Roark, although I wouldn’t pay a ton for that difference. Short answer, I think Roark is a good deal at 2/$15m. Corbin in town. That’s a different tax bracket . . . but directly related to whether they can afford to tender Roark. I’ll admit to skepticism on Corbin because he didn’t get good until this season, but he was really good. When I looked at the secondary stats of starters on the FA market a few days ago, Corbin was head and shoulders above everyone else. His xFIP of 2.61 was only 0.01 behind deGrom for best in the majors. He’s also a bit younger than most of the other guys on the market, although he won’t be by the time his six-year contract ends. With so many teams interested in him, he’s going to get that sixth year, plus an AAV closer to $25M than $20M, so something close to the Lester contract (6/150). I dunno. If he had three or four seasons like 2018, it would be a no-brainer, but then he’d also be looking for Scherzer-level money. there is risk there, certainly. It’s not my money either, but I’d say he is likely to generate the most WAR over the next three years of all the FA SPs. Projecting pitchers beyond 3 years is crazy due to injury risk. All those Cleveland starters are really good . . . which makes me scratch my head about why the Indians are even floating them. I guess they’re just saying “blow us away with a deal.” The Nats don’t have that kind of prospect ammo. I guess there’s a little possibility the Indians could have some interest in Eaton if Olney’s right and Bryce comes crawling back, but I would think it would take at least Eaton + Garcia to even start the conversation. About what Olney said . . .
I’m messing with the math. The thinking is that the Nats have around $35M left to give them the breathing room they want to stay under the tax line. One would think Bryce would end up with an AAV of at least around $32M since he turned down 10/$300M. So . . .
Only $3M left over, plus trade Eaton and his $8.4M so you’re at $11.4M. They still need a starter plus maybe a loogy. That takes them out of the Corbin conversation and probably the Morton/Happ one as well. But for $10M or less, there’s still a pretty good list: Cahill, Anderson, Miley, D. Holland, Hellickson, and Buchholz. They’re obviously not getting a higher-level lefty reliever out of what’s left, though, so they may end sticking with Solis. So it could be done, although it would be tight. It might not be quite as tight if Roark gets non-tendered or signs for a couple of mil under projected. Friday will be interesting. Flurry of Nats stuff. Everyone tendered and they signed a deal with Solis. If I have this right, that’s odd because it guarantees the whole thing instead of a tender. Unless it’s a minor league deal. If it truly is just Daniel Johnson straight up for Gomes, that’s an incredible deal. I do think Johnson has the potential to be better than Andrew Stevenson, but probably not much better, somewhere between AAAA and 5th OF on an MLB roster. Gomes strikes out too much but posted 2.2 fWAR and 16 HRs. He and Suzuki combined for 38 homers! Updating the math, with everyone tendered and Gomes to make $7M. Starting at $35M, that’s now down to $28M. From that, they’re probably only wanting one major starting pitcher instead of two, though. That number pretty much still leaves everyone in play, including Corbin. There’s a fair amount of buzz out there about the Nats still being in play with him, . . . but also some buzz that he’s wanting a SEVENTH year on the contract. Seeing scuttlebutt that the Nats have no interest in Murphy. (Sigh.) I’d be fine with a Matt Adams reunion at $4 or 5M. Adams really seemed to thrive with Kevin Long. Really, the minimum shopping list would be one starting pitcher, the LH 1B bench bat, and maybe another bullpen arm. Haven’t heard much about them looking at 2B. I guess the rest of the spending will depend on Corbin. If they were to end up with someone like Happ or Morton instead, they’d have more cash to consider guys like Sipp . . . and maybe Murphy. Looks like JRod, DJ and a PTBNL for Gomes. Eh, not as good but still ok by me. I think JRod will have some major league value before his career is done. Bigger loss than D.J., I think. Hoping the PTBNL is a nobody. Yeah, that deal makes more sense. I still like it. I never quite saw the excitement about J-Rod. His 5.97 FIP and 1.54 WHIP weren’t promising. Gomes is controlled for three seasons but has $1M buyouts for the last two if he craters. PTBNL usually isn’t anyone notable. Sometimes teams agree to a list of around 10 names to consider in order to go on and get the deal done. Or it could be a 2018 draft pick, who can’t officially be traded for another week or so (Trea Turner rule). Bigger one by the A’s was Fiers. Add him to the list of good affordable starters out there. We know Strickland can be a bit of an a-hole, but if the Nats feel like they need to add a little attitude . . .
Looks like Suzuki is better against RHP, but not by too much. Gomes slightly better against LHP. It will be interesting to see if they sort of platoon them, or have them lined up to work with certain pitchers, or what. I’ll bet there is a platoon slighty favoring Gomes – like 90-70 ish. @KW–I’d like to see them sign Strickland just as confirmation that Harper will NOT be back. Wally, I’m with you on the Roark tender looking suspect considering all the similar pitchers who didn’t get the offers. But then I didn’t think Roark should have been tendered in the first place. On the one hand, the Lerners are more than wealthy enough to absorb any luxury tax penalties. On the other hand, so are the Yankees, Cubs, Dodgers and basically every other highly wealthy team in the league outside of Boston has used the luxury tax and its penalties as a de-facto cap and have gone out of their way to avoid it. The situation is perhaps the biggest mis-calculation in the history of the MLBPA union … and yet they just re-upped Tony Clark’s contract, the one who negotiated it and didn’t see any of the consequences the players are currently seeing. Anyway. I would find it completely impossible to believe that Rizzo is “forcing the owners” hands by putting together a team without their input. I’d laugh out loud though if the Lerners were that incompetent and weren’t talking with their GM as he furiously makes moves. But its all moot; call me when the team signs a $20M/year guy and there’s no longer a neat pay slot for a $35M/year contract to fit into. Then we’ll know.